"Of course I would like to be," says the pilot, and his boss, Brivio, wants it and sees in him "a pilot who is very mature and leaves relaxed in the race". He has only signed in MotoGP the first victory of the many or many that are to come, but in Suzuki already begin to glimpse the possibility that Alex Rins continues to grow and become his Kevin Schwantz of the 21st century. "Hopefully it is ", assured his boss, Davide Brivio, to this newspaper very excited at the foot of the podium in COTA. 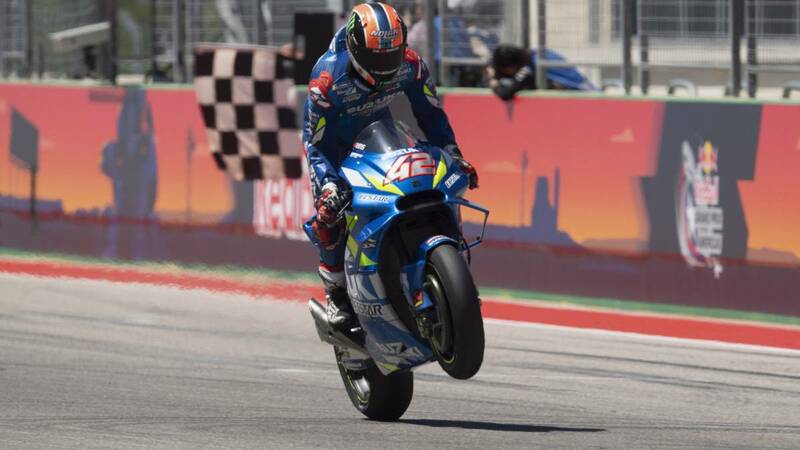 And the 23-year-old, already a winner on the Texas track in all three categories, does not cringe when the famous 34 is mentioned and the possible comparison with him: "Of course I would like to be the new Suzuki Schwantz. very big what he did for this factory and it would be incredible to reach his level ". All this, and despite the enormous joy of the moment, they said with some restraint, without throwing the bells on the fly and keeping their feet on the ground . And is that in the case of the Italian executive, is not the first time he dreams of having the new Schuantz of Suzuki in their ranks. It has already happened to Maverick Viñales, , who returned them to the path of victory at Silverstone 2016, but they could not keep him and ended up leaving to Yamaha. When asked Brivio what he will do to avoid repeating the story with the Barcelonan, he only says that "we are going to see how things develop" . It is prudent, but today makes it easier for their relationship to be It is still too early to talk about future contracts, because all the important saddles are closed until the end of the 2020 season, but in that sense says Diego Silvente, representative of the MotoGP winner in Austin, that "Rins agreed to take the helm of Suzuki at the time and is delighted to have done so, for the potential they have together, at the same time that he is grateful to his factory for the trust placed in him despite his youth and despite having started his way in MotoGP with a couple of important injuries, which made him miss his first preseason and some races ". Rins and Suzuki are in the beginning They have already added six podiums in the queen class and the highest step is no longer unknown to them. It is normal that flowers are thrown from time to time. Rins already said in Qatar that he considered that the Suzuki was already above the Yamaha, that he was here to think about the championship and that the driver who did not do it was better to dedicate himself to the marbles. In that sense, Brivio said satisfied: "I do not know if the Suzuki is better because the Yamaha, but in Texas it has been" . And when it comes to describing his driver, he did not forget what has yet to be improved: " He is a very mature driver, who manages tires very well and leaves relaxed in the race. He wears more in training, but is a racing animal. What he needs is to improve the fastest lap for the qualification, but it is something he can still learn. " Regarding the importance of the victory for Suzuki, Brivio says: " We are very happy and I think we deserved such a result, because we have grown a lot and Álex has improved a lot in the last year. Pair to this season, our goal was to get at least one victory and it has already been achieved, leaving us a lot of races ahead in which we can try to win again, why not? The objective has been fulfilled too soon, true, and now we must try to achieve it in other races and always be in the top five. Let's see what happens. "It looks like what happens will be good.